The Deseret News published an article yesterday (sustain it here) about the church’s massive efforts in the family history area. One of the areas being focused on is indexing of records. Up until now, the digitizing of such records was a slow, cumbersome process. As the article mentions, the church is currently beta testing a software program it has developed to speed up this process a great deal. Several stakes and other non-LDS organizations have been invited to participate in this pilot program. My stake is one of them. 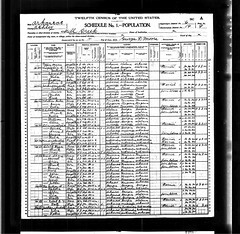 For about a month and a half now I have been using this program to digitize the 1900 census (mostly Pennsylvania). It took me a few weeks to get started because the program only runs on Windows, and I’m a mac user. But after making a deal with God (how does that sound for borderline blasphemy?) I was able to obtain a Macbook, and install Parallels to run Windows simultaneously. Now I can run PAF and the Indexing software. Our ward was instructed two months ago on how to use the software, with the Bishop challenging us afterwards to do 100-200 names per month (he might have said per week, though I can’t quite remember). Being pretty “turbo” on the computer (and always being on my computer) I decided to up the ante a little. I set a goal for myself to do 1000 names per month. I’m happy to report that I met my goal for the past month. I started on the 26th of August and by the 26th of September I had finished. Since the church tracks progress monthly, I’ll shift from the 26th of each month to the 1st now. It’s pretty easy to do, and I’ve enjoyed having something so productive and rewarding to do while I’m on the bus to and from work, or while on a lunch break. The hardest part is reading the cursive of men from 100 years ago… sometimes it gets pretty sloppy and hard to discern. But I know that this is moving the Lord’s work along (at an astoundingly fast pace!) and He will help me and others to do so. I look forward to when this program is publicly released so that all may participate and serve. As an ametuer geneologist I rarely count on MyFamily.org for any degree of accuracy. It seems to me (and I might be wrong) that it is just another tool to move the Mormon football down the field. Yes Mormonism and politics again. Ancestry.com seems to have an unbiased agenda which is something I cant say about MyFamily.org. First of all, it’s myfamily.com, not .org. MyFamily.com, Inc. (we, us or our) owns and operates the World Wide websites MyFamily.com, Ancestry.com, Ancestry.co.uk, Genealogy.com, RootsWeb.com and Ancestry.ca. Lastly, this post has nothing to do with this company. This is referring to the church’s efforts in family history, which is not affiliated with this private company. Using FamilySearch Indexing you indexed 114,345 names in January of 2006 compared to this past January of 2007 when you indexed 3,659,329 names. In just one year, we have seen an incredible increase in production of about 32 times as many names. Each one of you contributed to this amazing growth. Thank you very much and keep up the great work! Whoa, that’s quite the increase in user adoption and volunteer work! I’ve heard estimates that with this new software enabling us to pump through names a lot quicker, all the records in the Church’s granite vaults could be indexed and digitized within 2-3 years. Exciting stuff! You [all the “indexing patrons”] have indexed almost 29.5 million names during the first quarter of 2007. We currently have about 33 thousand indexers and over one hundred people are joining the workforce every day. The enthusiasm for this work is phenomenal. Wow! As the previous comment shows, in January there were 3.5 million records indexed. The following two months saw 26 million more records indexed. That’s an amazing increase in numbers. I am in awe at how quickly this project is progressing. Indexing is (and has been for some time now) open to the world. The work is progressing very rapidly, and in this month’s Ensign is further publicized by this article explaining the ins and outs of indexing. I was also pleased to discover (via the graphic inside the Ensign of the program running on a G4 powerbook) that the Java-based program is now available on a mac!